I ended up being very glad I went to the press conference, as it became a chance for me to meet a lot of different folks in the poker world whom I hadn’t spoken to face-to-face before. As far as the conference itself goes, the WPT was announcing its Season 9 yesterday, although it sounds like they aren’t quite ready to list all of the stops and schedule. Mike Sexton did open things up, however, by saying there would be “six, seven, [or] eight” events in the U.S. and Europe this year. 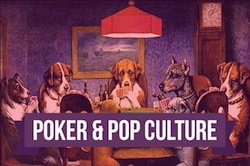 Then World Poker Tour CEO Steve Heller said a few things, including noting the WPT’s intention “to put more show in the show” by incorporating “more information, more context, [and] more entertainment.” Part of that effort will include hosts Mike Sexton and Vince Van Patten being at the events from Day 1, and having some segments from prior to the final table included in the broadcast, so as to give viewers a better feel for how those who made the final table got there. Savage noted how there was a kind of excitement surrounding the WPT at the moment, so much so that he said it “feels like Season 1.” Seemed to me like others in the room -- including the media -- were picking up on this excitement a bit, too. There is a lot of competition out there among the various pro circuits, but I believe most probably agree that it would be good for poker, generally speaking, for the WPT to start thriving once again. Pliska then introduced Kimberly Lansing -- a hostess for the show back on Season 6 of the WPT -- as the new “anchor” for the show. The position, explained Pliska, would be sort of like Bob Costas at the Olympics, and would help the show in its efforts to incorporate more context and commentary, as well as to “change the look and feel” so as to make it even more like a sporting event. Lansing said just a few words, then Van Patten was given the task of introducing one other new aspect of the WPT show, the Royal Flush Girls. Sort of seems like they are continuing the same hostess-type role originated by Shana Hiatt and later filled by Lansing and others, only now they’ll be rotating six different women to do the occasional on-camera stuff, including interviewing players. 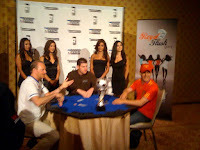 The conference proper then concluded with photos and one-on-one interviews while Marcel Luske and Carlos Mortensen played a heads-up match as part of a prop bet. Luske is from Amsterdam, and so will be supporting the Netherlands today in the World Cup final. Mortensen, meanwhile, is from Madrid, and so naturally is going to be pulling for Spain. Each wore his country’s jersey to the match, and the loser has to wear the other team’s jersey today during the final. That match was still going on when Jen and I left, but before we did I got the chance to chat with several people there. 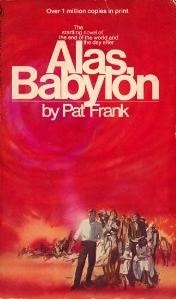 Ended up talking with both Sexton and Van Patten. As it happened, both were in my section on Saturday playing Day 2a of the Main Event, and so I spoke with each about reporting on them and their days. Sexton was eliminated on Saturday. I reported the hand in which he was short-stacked and all in with pocket kings versus two players. His opponents both had pocket pairs, too -- queens and nines -- but unfortunately for Sexton a nine flopped and he couldn’t catch up. “That’s poker,” Sexton said to me yesterday as he talked about the hand. We also chatted some about his time in North Carolina (my home state), where he lived for 15 years playing underground games before going to Vegas. Van Patten fared better on Day 2a. I reported on a couple of his hands early on, too, when he was mainly holding steady with about 75,000 chips. But near the end of the day he picked up a couple of big pots and bumped way up to 174,200, which I believe is a bit more than twice the average heading into Day 3. We talked a bit about his day and he asked me some questions about the reporting. Anyhow, I found him a very friendly guy and will confess to have gotten a kick out of all of his questions of me about the reporting side of things. I spoke with Matt Savage some, too, and he added a couple of other items about how the WPT events will go which I found interesting. He said that when they get to the final tables they will roll back the blinds if they are too high. He also said that at each WPT event they would be running bustout tourneys that would serve as satellites to the next WPT Main Event on the tour, which sounded like a cool idea to me. I also had the pleasure yesterday to meet and chat with Jesse May, author of the great Shut Up and Deal, which I just happened to have brought with me this summer to reread during those rare moments when I’ve had the time. We chatted about a few things, including his entertaining poker podcast and our mutual friends Kevmath and Dr. Pauly. Later in the day I met up with another friend, James, who has come to Vegas for what has now become an annual visit for him to see the WSOP and play some golf. He and I had dinner at the Hard Rock (the Pink Taco), and he then went over to watch some poker at the Rio. I passed on the latter -- have seen my share of poker lately, dontcha know -- instead making an early evening of it. Today will be taken up with what should be more fun times. There’s the WSOP Media tournament at noon in which it looks like something like 130 folks will be playing (perhaps more). Then later in the day PokerNews is also having its annual freeroll, too, in which I also plan to play, barring some crazy deep run in the WSOP Media event. Should be a fun day -- a good way to kick off my last week in Vegas. Hope you get a chance to relax and enjoy your Sunday, too.